Here at The Bike Stop, we are always on the lookout for cool new bicycle related products. Recently we came across a project called COBI system. This is the most encompassing device I’ve personally ever seen and I think many of you would agree! As of right now, the product is in the development stage and currently has 10 days left in its Kickstarter campaign. They anticipate the first kickstarter orders will be delivered by June 2015 as it’s nearing the end of its development. So, what exactly is the COBI system? It’s almost like having a car, without the car! There are so many different functions, from enabling you to change songs and volume on your smart phone with just your thumb, to an alarm if someone besides yourself tries to unlock your bike, to a brake light and turn signals, they really seem to have thought of everything. These are just a few of the many functions that you can read about on their campaign page. Okay, we’ve established that the COBI system is pretty sweet and has a ton of different, useful functions, but what does it look like? Is it ugly? Would you want it on your bike? Well, it’s actually pretty cool looking! The hub has a light on it and there are many ways to customize, including four different base colors, 30 accent colors, and designer decals! Make it your own so you’ll always love you COBI system. 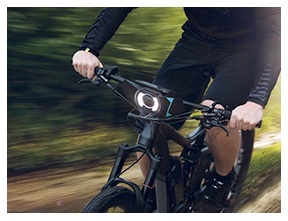 This thing also works on electric bikes as well as standard bikes and works with most smart phones (full list can be found on their kickstarter campaign page). What do you think? Would you like one of these? We would love to hear your ideas in the comment section!